Ireland were runners up in the 2014 International Cup and will be looking to return to Australia and retake the title. The Australian Rules Football League of Ireland (ARFLI) was founded in 2000, but Aussie Rules actually came to Ireland in 1999 when squads in Belfast and Dublin recruited through the off season. The new Dublin Demons traveled to London in April, 2000 to take part in preseason matches with the British Australian Rules Football League (BARFL), and finished third out of 12 teams. The Demons then won a best-of-three series with the Belfast Redbacks to be crowned the first Irish footy premiers. Michael Currane and Ciaran O hEeadhra both have their fingerprints all over Irish footy, as does Michael’s younger brother Brian, who is the Warriors head coach for IC17. Brian (along with Diarmuid Griffin) helped form the Leeside Lions over 15 years ago. Michael founded the European Australian Rules Football Council (EARFC) in early 2001 with the goal of developing the sport of Aussie Rules across the continent and strengthening ties between the already established leagues. The local league, the Australian Rules Football League of Ireland (ARFLI), has become quite competitive and players of all skill levels come to play. Current premiers Leeside Lions are hoping to move to their new 75,000-seat stadium near Ballinderry Park, Mayfeild. Additionally, two university-level teams have begun play and are helping to make the game successful in the long-term. The Warriors have competed in every International Cup, winning the inaugural event over Papua New Guinea in 2002, placing 4th in 2005 and 2008, and becoming the first team to win multiple International Cup titles when they again defeated PNG in the 2011 final. 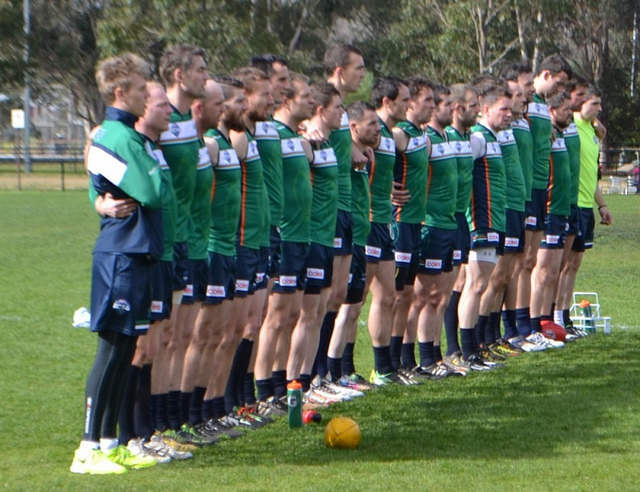 They’re the fourth-ranked team in the world in the most recent World Footy News rankings. 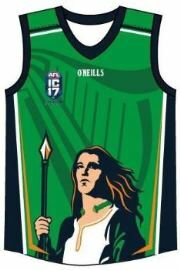 Both the Warriors and the Banshees on the women’s side will wear a special change strip in the competition honoring the memory of Irish and Melbourne champion Jim Stynes who died five years ago. Stynes was a great footballer who played 264 games for Melbourne and won the 1991 Brownlow Medal. He is the first (and so far only) overseas player to win the award. He also served as former Chairman of the Melbourne Football Club. Jim’s younger brother David has played on both Ireland’s IC-winning squads in the men’s division and will be involved again this time as part of the coaching staff. Zach Tuohy was born in Portlaoise, Laois, Ireland and grew up playing Gaelic football with Mayo. He played from 2010-2016 for Carlton in the AFL and is in his first season wearing a Geelong Guernsey. 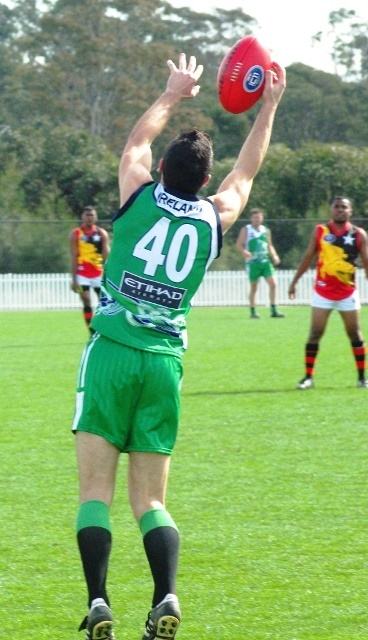 Pearce Hanley of Ballaghaderreen also played at the Gaelic level, and his AFL career stretches back to 2008 with the Brisbane Lions, with whom he played until 2016. Fellow Irishman Colm Begley was Hanley’s mentor in 2008 with the Lions. Hanley has now played in eight games with the Gold Coast Suns in 2017. Tadhg Kennelly of Listowel (County Kerry) played from 2001-08 with Sydney and played in the 2005 and 2006 Grand Final with the Swans, winning in ’05. Other Gaelic football alumn currently playingi in the AFL include Conor McKenna (Essendon), Conor Glass (Haththorn), Mark O'Connor (Geelong) and Ciaran Byrne (Carlton). The skills required for Gaelic football translate well onto the footy pitch, but the down side is that pitch sizes are smaller and require them to play on smaller fields and to play with teams of nine, 12, or 14, so stamina could become an issue late in games. The Warriors have placed second in their last two major tournaments. They went into IC14 as the top seed and defending champions and opened with a 45-point win over Fiji. They moved through to the finals series with wins over France and Nauru. After defeating South Africa in the semifinals, they met Papua New Guinea in the finals for the second consecutive IC, but PNG rallied in the fourth term to take the title. They advanced to the finals series at the European Championships in Lisbon, Portugal in October, 2016 with pool play wins over France, Russia, and Jerusalem Peace Team Lions. The Warriors would fall in the Grand Final 53-39 in extra time to Croatia as the Knights would become European premiers. It should be noted that the team in Melbourne will be much stronger than in this tournament due to the inclusion of a number of Australian based players. These two close tourney losses will surely serve as motivation for the Warriors as they prepare for IC17. The Irish Warriors face a difficult draw in Division 1 as they are due to meet reigning premiers Papua New Guinea, plus France, Great Britain, and New Zealand, who have never placed outside the top 4 and were winners in 2005. World Footy News has PNG ranked second, New Zealand 3rd, and Great Britain 8th. Back to back major tournament runner-up finishes will surely have this Warriors team hungry for competition in Melbourne, and they have a knack for playing in big games. Though the schedule does them no favours, expect them to be major players at IC17 as they aim for their third title. The men's team will be Captained by Antrim’s David McElhone and is Coached by Brian Currane, with tournament veteran Mick Finn acting as Player/Assistant Coach. The tall, imposing figure of Irish Captain Mick Finn will amazingly partake in his fifth straight International Cup having been named in the team of the tournament on four previous occasions. He was named ‘Best and fairest’ in the 2008 tournament and backed that up with a Best on Ground performance in a 4 goal display in the 2011 Grand Final. In 2014 he was again player of the tournament and named captain of the World Team. An outstanding contested mark and noted for kicking goals from distance. This time around Finn will be part of the coaching team as well as playing. Padraig Lucey was another big performer at the IC14 tournament after featuring on the FOX 8 show The Recruit that year. Spent two seasons at Geelong and played well in the VFL but did not make it to the AFL competition. In 2017 has been playing in the ruck for Newtown (in the Geelong Football League). Previously played for the European Legion AFL team and the Irish basketball team at underage levels. Will again be a handful in the ruck and up forward for teams without comparable height. Muiris Bartley has become a fixture in the Irish team whether it be in Europe or Australia. First coming to prominence in the World XVIII team when it was a mix of International and Multicultural players he has gone on to represent Ireland regularly. He has backgrounds in playing both GAA football and rugby. A confident centre half forward Bartley likes the physical stuff, is pacey and a brilliant finisher. IRELAND SCHEDULE Rounds 1-4 times AEST and BST.